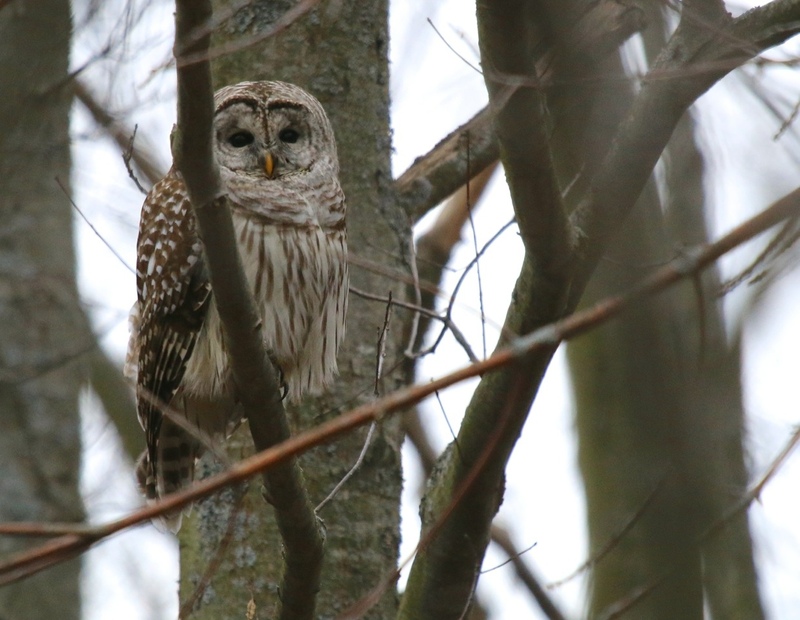 It’s been a pretty sleepy winter around here for finding owls, and even my feeder birds have been few and far between. 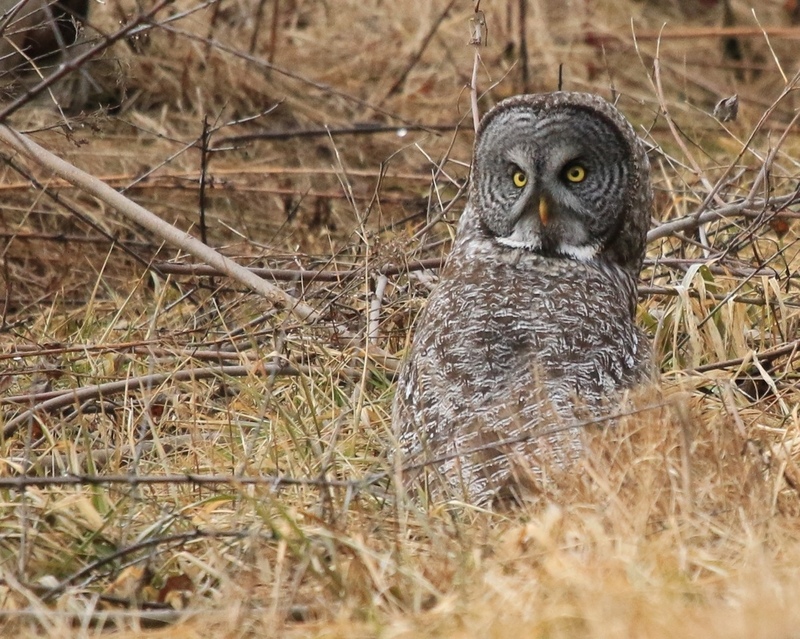 So when news of visiting Great Gray Owls in my local area came to light in late February, I headed out with great excitement to try to find one of these rare and beautiful birds from the north. 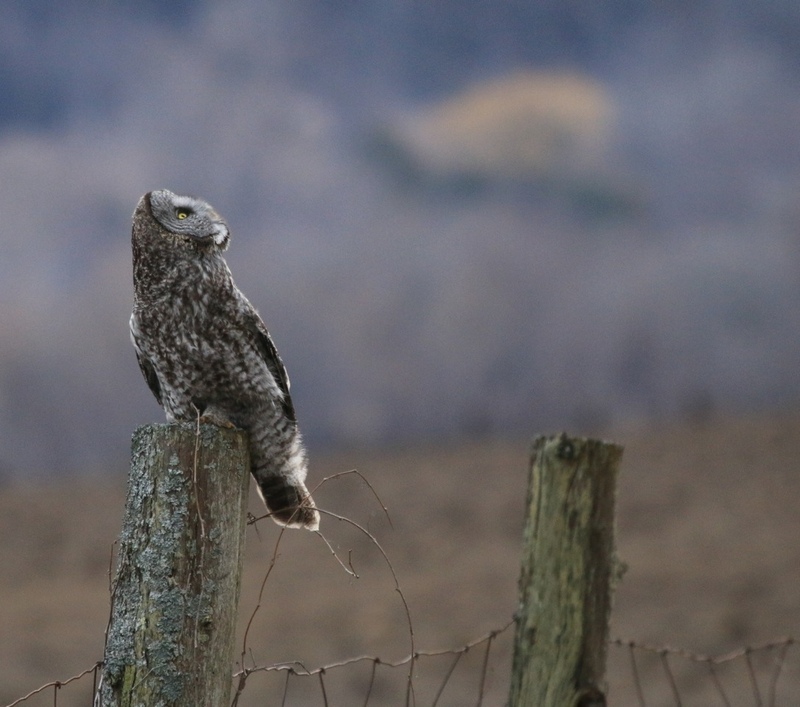 Great Gray Owls make their home in the vast boreal forest, and have very little “street sense” as they are not used to people or traffic. When they head south looking for food, they tend to set up in areas where there is good hunting, often at roadsides. This makes them pretty easy to find, and particularly vulnerable. 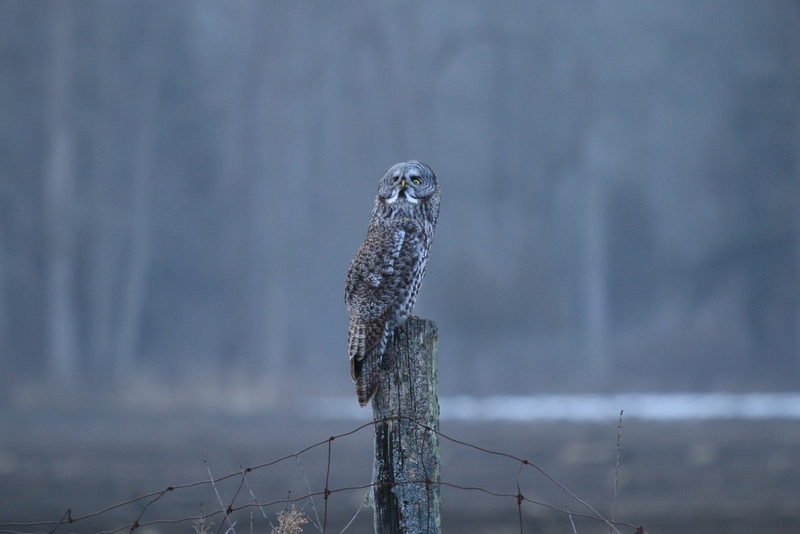 Here is an early morning shot of one of the owls, the first morning I saw one. The feather patterns make for remarkable camouflage, and it would be easy to drive past. But word spreads fast, and soon enough groups of people were gathering to watch the owls, as they were often sitting right out in the open. Great Grays seem to be pretty aware of crows, despite their lack of knowledge about people. 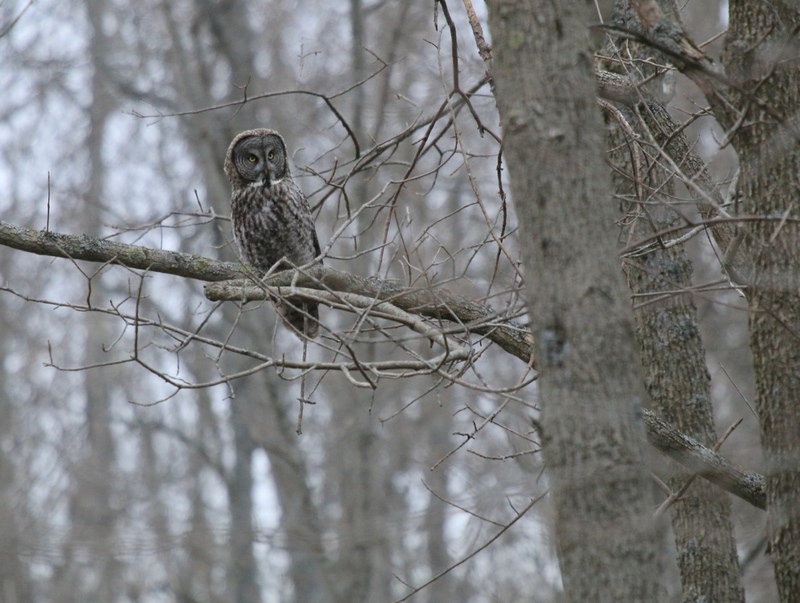 Notice how this owl is all pulled in skinny in this photo because it was being harassed by crows from above. 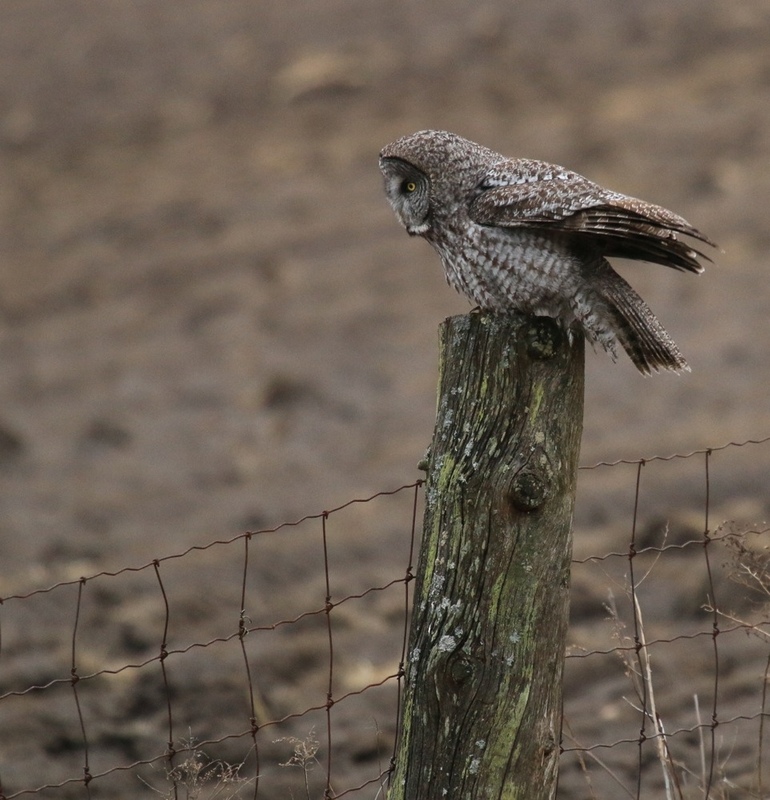 This owl was keenly focused on movement in the ditch at the roadside. These fields must have been rich in rodents, as I also found a Barred Owl there on the last afternoon I visited. 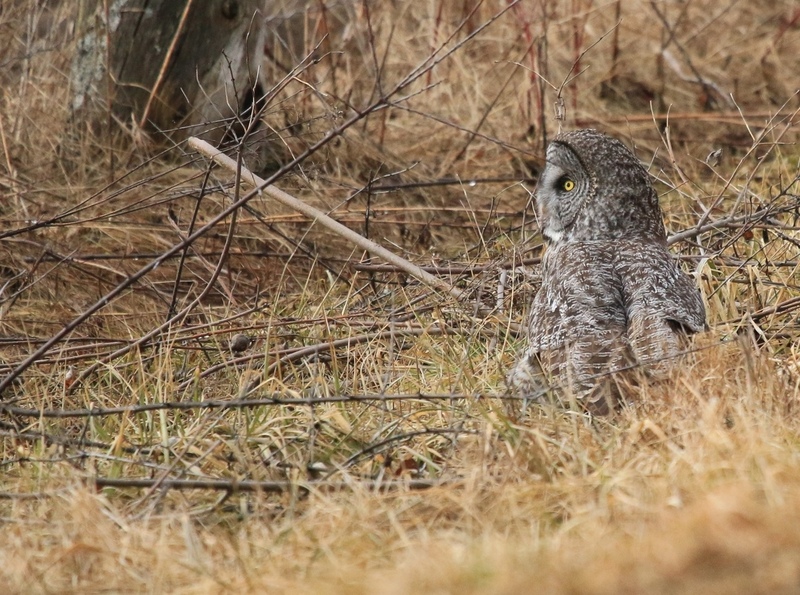 This owl was only a couple of steps away from the road. I feel so privileged to have been able to see these beautiful owls and watch their fascinating behaviour, but I also began to question the human impact on these birds with so many people around. On the third and last afternoon I visited I found out that one of the owls had been struck and killed by a car. A man had it in the back of his car in a cooler and planned on getting it stuffed. 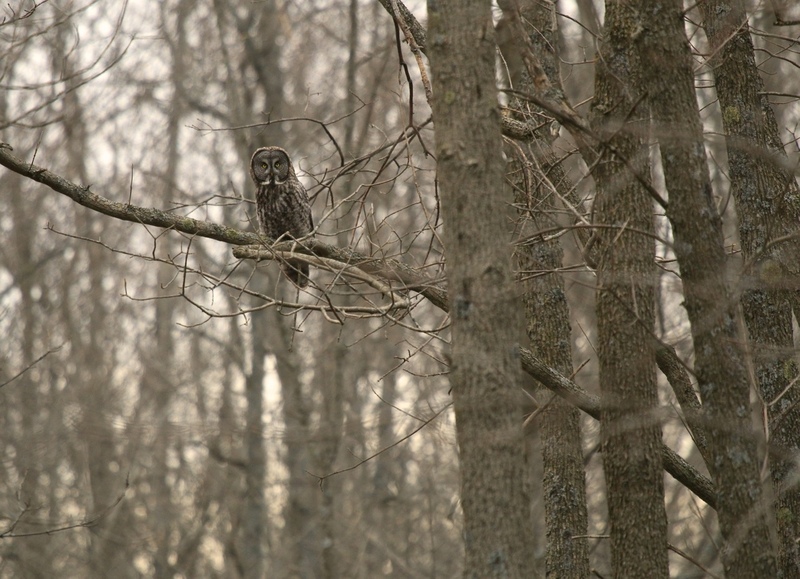 I heard later that a group of photographers were chasing one of the owls, trespassing on private property, and baiting the owl with live mice to get hunting and flight shots. I haven’t been back. If these owls are now associating humans or cars with food, they are even more vulnerable and my presence there will only further endanger them. This situation has really caused me to ask myself a lot of ethical questions about observing and photographing birds. The truth is, any time a human is in proximity to a wild bird, it will affect its behaviour. But there are a couple of simple questions we need to ask ourselves as we head out birding or taking photos. -Could my behaviour put this bird in harm’s way? Getting closer, chasing the bird, causing it to fly, or feeding it near a roadway can all have devastating consequences, like it did here. -What is my motivation for what I am doing right now? Be honest with yourself and think about whether disturbing the bird is really worth it. We all have moral and ethical “lines” that can change and evolve over time in many areas of our lives. Why not pledge to do as little harm as possible? I have learned that if you sit back, give the bird space, wait, and are patient, you will be privileged to observe some fascinating natural behaviour from the bird. 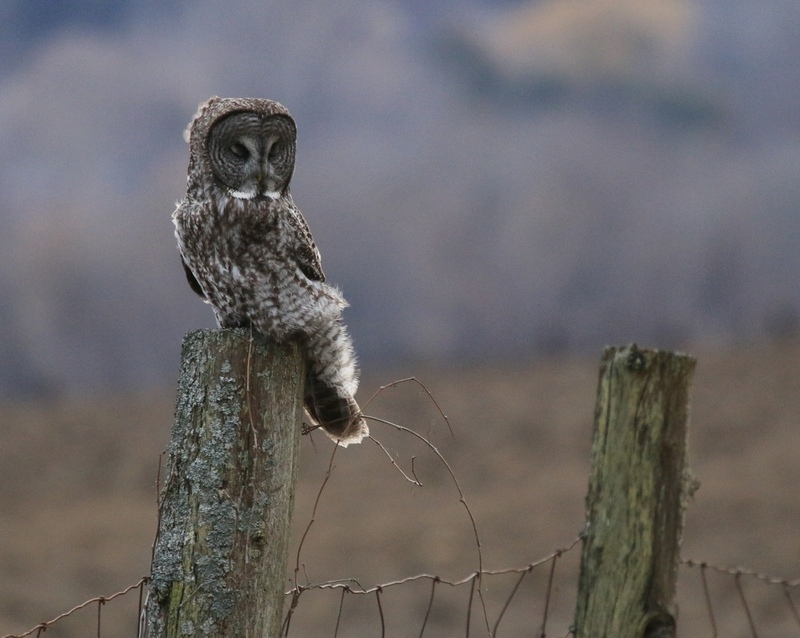 birding, ethics, Great Gray Owl, ontario, photography. Bookmark. Well said Leslie. I also disagree with baiting to get photos. Beautiful shots! I naively expected that all wildlife photographers were nature lovers with all that entails. Sadly, this is obviously not the case. Baiting and chasing birds is deplorable. Thank you for writing this post. I hope it makes some stop to think. Thanks for writing Barb. We have to try to do as little harm as possible. With that in mind, the animals stand a chance. Wonderful photos. What magnificent creatures. Regarding the ethical questions you posed. I think aggressive human invasion and any attempt to alter behaviour for personal advantage is wrong. Always. Everywhere. We have done enough harm to our environment and the creatures around us. That having been said, I also think that the educated and non interfering manner in which you behave, when taking these wonderful pictures, is admirable and shows great reverence for our precious wildlife. Please do not let the disgraceful behaviour of some people discourage you from the wonderful work that you do. Your photos are breath-taking! And some people should be run over by their own cars. How terribly sad. Thanks Yvette. Makes you wonder, eh? You are completely right in not disturbing their natural behaviour life style. 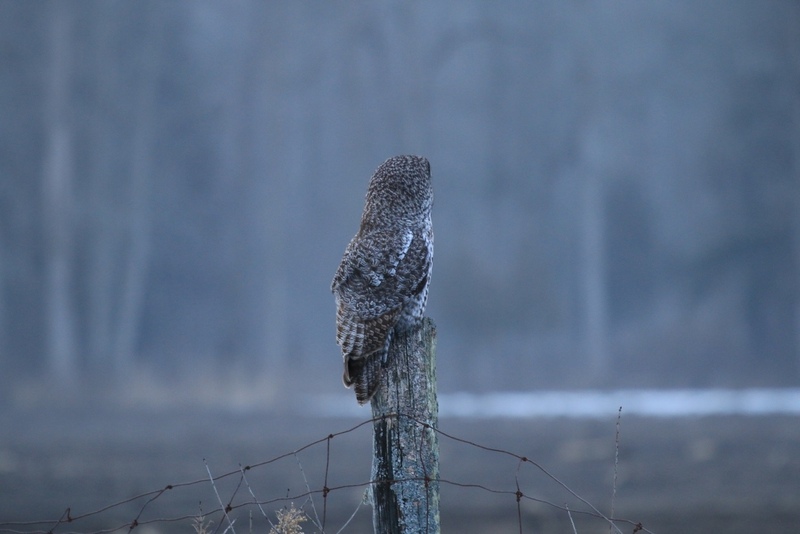 The Great Greys are magnificent looking owls so it must be difficult to pass up opportunities to view them but until I recently listened to a CBC radio program I had no idea that many birds in the wild were being baited for better action shots. That certainly made me think too. Thank you, Leslie for making all of us aware of our actions on wild life. I know what a patient person you are and I appreciate that your photos of these beauties are not staged.